Jaipur, April 2 (CRICKETNMORE): Leg-spinner Shreyas Gopal snared three wickets in three overs as Rajasthan Royals rode his devastating spell to restrict Royal Challengers Bangalore (RCB) to 158/4 in 20 overs in their IPL game here on Tuesday. Given the ball in the seventh over, Gopal (3/12) first broke skipper Virat Kohli (23; 25b; 3x4) and Parthiv Patel's 49-run partnership for the opening wicket, then cut short AB de Villiers and Shimron Hetymer's stay at the crease in his next two overs as the visitors were reduced to 73/3 in 10.1 overs. 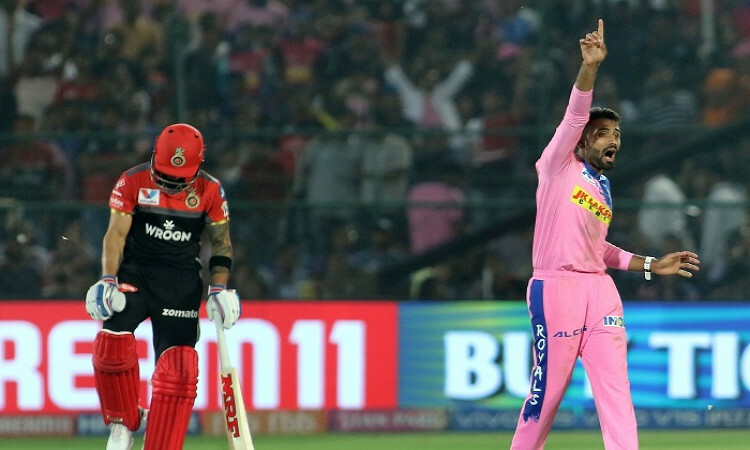 Put in to bat, Patel top-scored for RCB with a patient 41-ball 67 -- his knock laced with nine fours and a six -- while Marcus Stoinis was unbeaten on 31 off 28 balls and Moeen Ali played a nine-ball 18 run cameo to help the struggling outfit post a competitive total. Patel and Stoinis joined hands for a 53-run stand for the fourth wicket. In the final over, Jofra Archer (1/47) leaked 17 runs with Moeen smashing him for a six and a four as RCB managed to score 51 runs in the last five overs. RCB were off to a good start as Kohli looked in positive frame of mind from ball one, working K. Gowtham through midwicket for a couple of runs. The skipper, who hasn't been in his peerless best so far, found the boundary the same over as 10 runs came off it. Kohli edged a fifth-stump outswinger from Dhawal Kulkarni in the next over but the ball raced to the third man as he was stationed quite square. Facing most of the deliveries in the early stages, Kohli was looking good when Patel joined him to welcome Archer by hitting him for three fours in the fifth over. At the end of six overs, RCB were 48/0, but just after the Powerplay, Gopal removed Kohli with a superb googly that beat the right-hander all ends up to crash into the stumps through the gate. Gopal did not stop, sending the other 'big fish' de Villiers back in the hut in the ninth over for just 13 with another wrong' un that stopped on the batsman forcing him to punch the ball back to the bowler. As if to complete the trio, Gopal accounted for Hetmyer (1) as well two overs later, the big-hitting West Indian failing to read another googly that turned away from him to take the outside edge for Jos Buttler to complete a sharp catch behind the stumps. Patel and Stoinis tried to steady the ship from there on with the Australian struggling to get going. Patel tried his best to drag the team to a fighting total but holed out to Ajinkya Rahane at long on off Archer in the 18th over, looking to up the ante. From then on, Stoinis and Moeen hit a few boundaries to end on a high.